Once you have a nice three by five foot wall chart, how do you hang it on the wall with more style than a couple of nails or lots of tape? And if it's a gift, not only does appearance matter, but transporting or shipping can be a concern. I've found a simple way to make stretchers for the top and bottom of the chart that allow it to hang nicely, and still allow the chart to be rolled for storage or shipped in a standard mailing tube. The top and bottom stretchers are identical, except for the hanging chain. They are made of wood, about 1 inch square, and long enough to span the width of the chart. I cut a small cove along the front edges for decoration, stopping it about 3 inches from each end (optional). Each stretcher is split down the middle, then the two pieces are reattached with the paper between them, using small screws installed from the back. This allows the stretchers to be easily reused if the chart is reprinted. 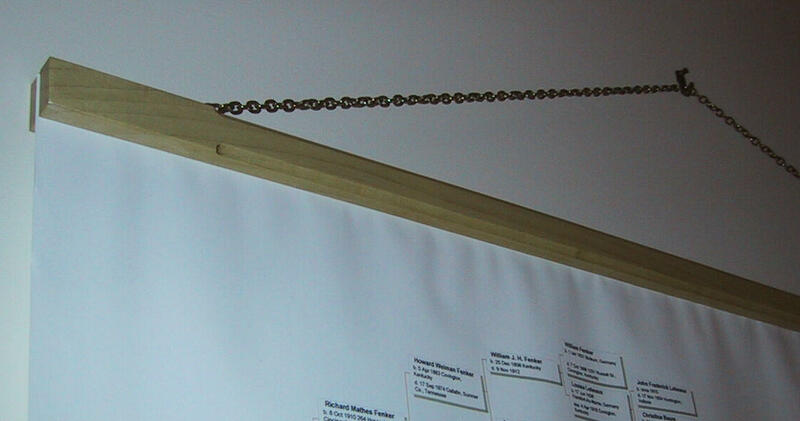 I used small eye screws to attach a decorative chain to the top stretcher for hanging. They look nice with a natural finish, but you could also paint them. For a natural finish, I would make them from an attractive hardwood for better appearance. If you have woodworking tools, it only takes an hour or two to make a pair, other than the finish. If woodworking isn't your thing, I would think any woodworking shop could turn out a set or two for a reasonable price.